Identifying and resolving problems relates to throughput time variation caused by unplanned production disruptions. Any manufacturing system experiences disruptions and must be able to solve them. 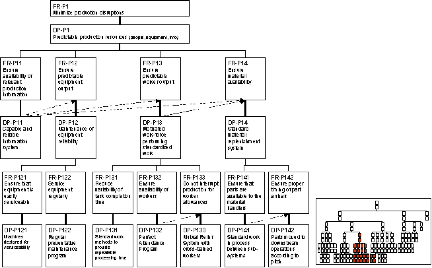 This section discusses the decomposition of FR-R1 “Respond rapidly to production disruptions” and its corresponding DP-R1 “Procedure for detection and response to production disruptions” as shown in Figure 1. The main goal of the decomposition branch is to achieve a manufacturing system that can be improved by being able to recognize and eliminate weaknesses. Figure 2: Decomposition of requirements to reduce variability in throughput time. The underlying thinking of the decomposition of DP-R11 is that the sub-system configuration (design and operation) supports the operator in recognizing disruptions (when, where and what). Technology can be a great help in achieving these goals by providing instantaneous feedback about the state of the manufacturing system. However, the perspective taken here is that the operator is the ultimate source of dealing with disruptions, which is expressed in the wording of DP-R11 and DP-R12. Rapidly responding to and resolving of production disruptions creates the basis to eliminate production disruptions. 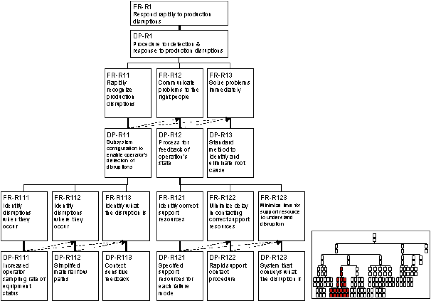 To minimize production disruptions (FR-P1), predictable production resources are required (DP-P1). Four types of production resources must be predictable: information (FR-P11), operator (FR-P12), equipment (FR-P13), and material (FR-P14), as shown in Figure 1. Figure 1: The output of production resources must be as predicable as possible. Figure 1 highlights the importance of a capable and reliable information system (FR-P11). An information system allows the gathering and storing of data, its transformation into information, and the transfer of information from sender to receiver. Thus, the information system supports the achievement of predictable output from all resources of the manufacturing system by providing timely, reliable, and relevant information. The decomposition of FR-P12, “Ensure predictable equipment output,” and its corresponding DP stresses that equipment must be designed for serviceability (FR-P121) to achieve successful maintenance (FR-P122). Further details about equipment maintenance can be found in the literature of total productive maintenance [e.g. Nakajima, 1989]. There are numerous norms and guidelines for the design of work systems from ergonomic to psychological aspects to achieve stable operator output (FR-P13) [e.g. ReFa, 1993; Grote et al., 2000]. Quality and cost aspects of standard work procedures are covered by DP-Q122 for stable quality output and by the decomposition of the direct labor branch (DP-D1). Three requirements are defined to achieve stable time output from operators as shown in Figure 1: reducing variation of task completion time (FR-P131) by defining standard work methods (DP-P131); ensuring that operators are available when tasks need to be performed (FR-P132); and avoiding production disruptions due to worker allowances (FR-P133) by mutual relief (DP-P133). Cross training also increases operators’ competence and flexibility and helps to improve quality and reduce costs. The performance of standard work influences the availability and delivery of material. Thus, DP-P13 affects FR-P14 “Ensure material availability” (see arrow between DP-P13 and FR-P14 in Figure 1). FR-P14 requires parts to be available when demanded (FR-P141) and to ensure proper timing of part arrival at downstream processes (FR-P142). Standard Work In Process (SWIP) between subsystems (DP-P141) serves as a buffer against production uncertainties and transportation delays. Low volume manufacturing may require a different strategy to ensure part availability, since it might not be possible to keep standard amounts of material between the manufacturing processes.